#LovingMyRelaxedHair Presents Straight From Eden Giveaway! 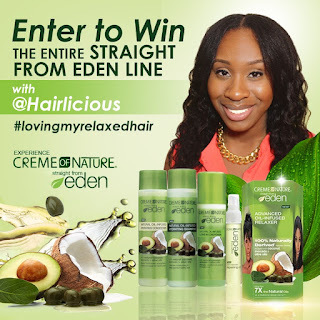 - Enter to Win NOW - Hairlicious Inc. I love my relaxed hair because of the manageability it provides and the fact that I can go from a sleek bun to a Bantu knot out to a roller set with ease. I love my relaxed hair because I finally understand how to take care of it. As a kid, my hair was over processed and extremely damaged and I thought that relaxed hair was supposed to be that way. After tons of reading and YouTube videos I finally got a grip on my regimen. I love the ease of styling my hair. I love being able to know when I need more protein or moisture. I love seeing when my hair falls in love with a product. i love that I do not have to use heat to have sleek and straight hair. I love my relaxed hair and have no intents on going natural any time soon. I LOVE my relaxed hair because it allows me to style it whichever way I want, whether it be rocking it straight or wearing bantu knots, flexible rods and braidouts. I love the low maintenance of my relaxed hair and the fact that I don't have to spend extra time to style my hair. And most importantly I love my relaxed hair because believe that relaxed hair can be healthy, long, and beautiful as long as you take care of it. My relaxed hair is super thick and manageable! I love the versatility of my relaxed hair & the fact that I can wear any style with it! I LOVE my Relaxed Hair because it is manageable and above all else–it is MY CHOICE. When everyone around me has gone with the natural hair movement, I've marched to the beat of my own drum and stuck with what works for me! I haven't been pressured into going natural just because more and more people have decided to transition. It's more than just hair and I know the more I keep up with my regimen, the healthier it will be and length will follow. I love my Relaxed Hair because I know how far it has come. I know that I *can* have healthy Relaxed Hair! I love my relaxed hair because it's a reflection of me. Sometimes it's straight, sometimes it's curly or wavy...it's textured. Despite what others may think or say, it's versatile and healthy. It's always growing, sometimes fast and sometimes at snail's pace, but still growing. It may bend, it may break, but with a little TLC it's bounce back is crazy! My relaxed hair is me, and I love it. I am loving my relaxed hair because I have the best of both worlds. I recently started texlaxing my hair and I am in love. I stil get to see my wonderful curl pattern but its soft and manageable. I love my relaxed hair because it fits into my lifestyle. It allows me to be versitale and creative. My relaxed hair lets me be me. I love my relaxed hair because it's more manageable and because it simply works for me! I tried going the natural route because of pressure from people in the natural hair community. Some people believe that relaxing your hair means you're not proud of your heritage.That mindset could not be more wrong! Relaxing is convenient for me and I love the results I get. I love my relaxed hair because it is healthy, strong, and ALL mine!!!!! I love my relaxed hair because it's less frizzy and much easier to maintain and take care of! It's more manageable so I can do way more hairstyles. My relaxed hair is also very soft and I love playing with it! I have a busy schedule and relaxed hair allows me to style my hair quickly in the mornings. It is also very versatile and I can try all different kinds of styles. I love my relaxed hair because it's versatile and easy to style. Very convenient for a busy mom like me. I love my relaxed hair because it is low maintenance and I still have enough texture left in my hair to wear a wash and go if I wanted to. I love how versatile my hair is, and I love that it doesn't shrink, and allows me to show off my length. I first relaxed my hair in 2001. It had always been healthy and manageable. I never thought too much about my natural curls till I moved to the US last year and began watching all these videos about the benefits of having natural healthy hair. I caught the fever and decided to transition. Six months and one big chop later, I missed my relaxed hair so much that I began having a hair identity crisis. One night after crying in frustration over what to do with my hair (and why I just couldn't get my hair to look as lovely as the naturalistas on YouTube) I gave in. I went to a beauty supply store and got dark n lovely relaxer, and on a whim I also got creme of nature's Argan oil leave in conditioner. My hair is really healthy and soft right now and I know it is because of the leave in conditioner. I am currently trying out the Straight from Eden oil infused leave in conditioner and I love it too. I really hope I can have the opportunity to also try out other products from this amazing line. Natural hair is great and all but I guess it wasn't for me. I really love my relaxed and healthy hair. I have been natural for 2 years but I love my hair most in its relaxed state. My hair is really fine and yet the mildest of relaxers have dried and and caused extensive breakage to my hair. The reason I went natural was because my hair was beyond damaged, so I cut it off and transitioned. I have had my eye on the Straight from Eden line and would love to be selected as one of the winners to try the relaxer. I love my relaxed hair because it was such a freeing experience, I realized that I was not bound anymore by anyone's expectations for me to have natural hair. When I starting relaxing my hair, I had to learn to braid, twist and curl my hair. As a result, I saved a lot of money by not going to the hairdressers every week and I became more adventurous. With so many ladies transitioning to natural hair, I wanted to see what the hype was all about. I wanted my “YouTube Big Chop” moment. Lol... So I tried to dislike my relaxed hair enough to say, "Okay, I'm done with it...never again." When my hair is relaxed, I am relaxed. My life is complicated and relaxed hair gives me the flexibility to have quick wash days and easy styling options. I can easily manipulate my hair from curly to straight...even without heat and damaging styling tools. I love my relaxed hair because it's MY hair. Not gonna lie I grew up bald headed because my mom didn't know how to take care of me and my sisters hair. But eventually I stumbled unto to hairlista and my hair journey began. It was tough and me and my hair went through some ups and downs but it's the hair that God blessed me with and when I finally learned how to properly manage my hair it hasn't stopped growing. I LOVE my relaxed hair because It is the healthiest it has been in a while because I'm learning and understanding how to care for it. I love my relaxed hair because it is easy to style. My hair is more managaeable and i dont have to spend alot of time grooming it. I dont feel pressured to go natural either cause i enjoy wearing my hair relaxed. I maintain my hair as best as possible to ensure that its healthy. I love my relaxed hair because despite what others say relaxed hair can be healthy too! I love that I can wear my hair straight, curly, crinkly, and in so many other styles. I started my hair in 2010 and didn't know anything about keeping my relaxed hair healthy. Thanks to researching and Hairlista my relaxed hair is the healthiest it's ever been!!! I love my relaxed hair because I'm finally learning how to take care of it. Because of this, my hair is responding back SO positively. It is really growing. I have also starting my daughter's relaxed hair journey and she has already made it to waist length. I use to be so frustrated with our hair, that was before I started reading and learning about our hair types. I also discovered oils and moisturizing & sealing (which has made our hair do an entire 180). I never thought I would be able to grow healthy, relaxed hair and I am completely shocked. Hi; I love my relaxed hair because it easy to manage, shinny and I spend less time to style my hair. I know my relaxed hair and its easy for me to deal with especially with school. Although am relaxed my hair is pretty full and I love it. I love how easy it is to style. Easy to change my look from day to day without spending a ton of time. I love my relaxed hair because it is versatile and strong. Since I started my hair journey in 2013, I have learned what my hair loves and responds well to and seeing it flourish has made me a more confident person. While I have nothing against natural hair, I am currently loving the fullness, shine and overall health of my relaxed hair. I love my relaxed hair because it allows me to create so many hairstyles! I love the feeling of a fresh relaxer and the fact that I can work with my natural hair during stretches. I love my relaxed hair because of the versatility and manageability. I was natural for 3 years and over time I learned that natural is not for everybody. I feel that my hair looks it's best when relaxed. I am now on my healthy hair journey and I am loving it! I believe relaxed hair can flourish just as well as natural hair with patience and knowledge of what's best for your hair. I love my relaxed hair because it is easier for me to maintain. All I have to do at night after I moisturize and seal it, is wrap it. In my opinion, that is the simplest night time routine. My healthy relaxed hair is just as versatile as natural hair, I just prefer to wear my hair straight. In the past, I have tried to transition but it didn't work for me and I'm not into doing the big chop or wearing extensions. I just stick to what works best for me, and thats my healthy relaxed hair. I love my relaxed hair because it is beautiful, strong and healthy. With the right products and consistent regimen and proper diet, all that choose to be can be relaxed and healthy. The term relaxed healthy hair is no longer an oxymoron. Relaxed ladies unite!! I love my relaxed hair because it's easy to style. Most of the time I can do a roller set and that's good enough for me. If I decide to flat iron it, it doesn't revert, I just have to wrap it at night and bam it's a go the next morning. I get so much body and shine with it. I love the compliments I get on it.